Eli on holiday in the UK. 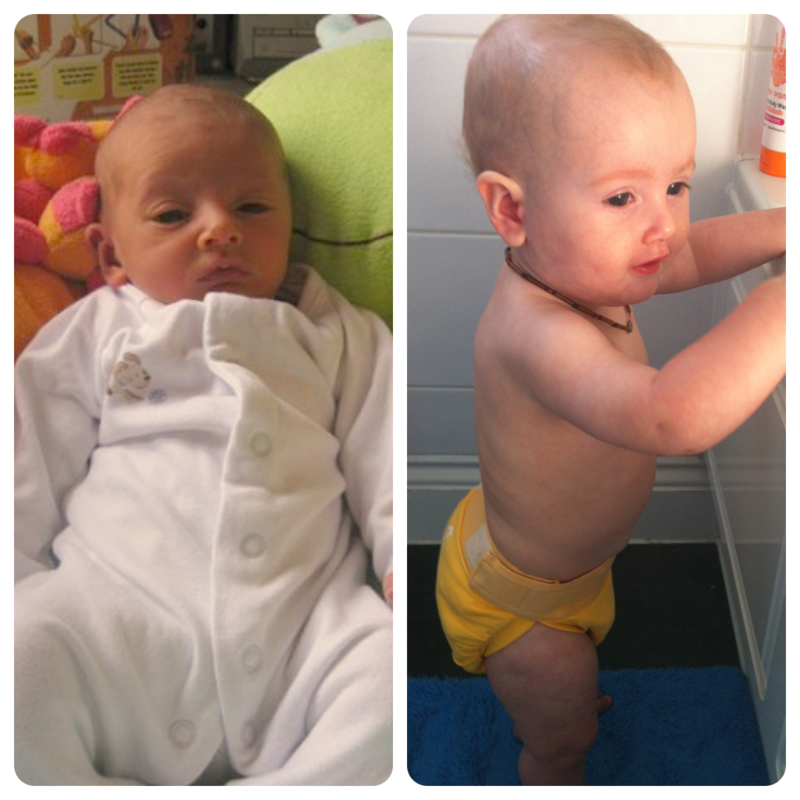 When you’re using cloth nappies full-time going on holiday – or any extended stay away from home – means a decision is to be made, do the nappies stay or do they go? 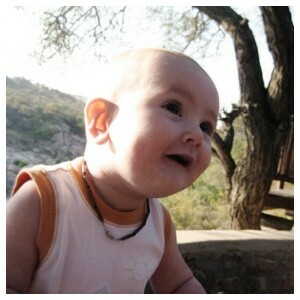 I’ve been away twice with Eli, once on a 5 day family holiday in the UK and soon after to South Africa for two weeks when my father passed away suddenly whilst on holiday there with my Mum. Obviously these were two completely different types of trips but whether or not to take my cloth nappies with me was definitely a consideration both times. For our holiday in the UK the choice wasn’t too hard: we were only going for 5 days and I knew I had enough nappies even though we didn’t have access to a washing machine. 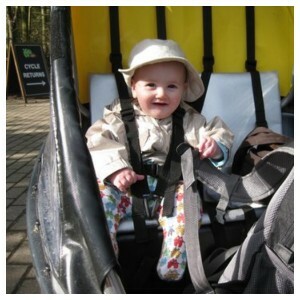 As we were travelling by car we had enough space to pack our full complement of nappies. The only issue was where to store the dirty nappies – a nappy bucket wasn’t an option so we needed a good-sized wet bag (or two) which would zip shut to keep any smells contained. After a bit of research I found a set of Bum Deal wet bags which did the job brilliantly. It was great, no need to buy disposables and all I had to do was to put the nappy wash on as soon as we got home. Eli at my Mum’s house in South Africa. Travelling to South Africa was a bit different. It was an unplanned trip (obviously) and organising an emergency passport for Eli and sorting last minute plane tickets were immediate considerations. Whether or not to pack cloth nappies was a consideration though once everything else was sorted. I didn’t do it though, I bought two weeks worth of eco-disposables (not something easily available in SA) and it was okay. If I had to do it again though I would do it differently. Firstly as I stayed at my brother’s flat and my Mum’s house washing wouldn’t have been an issue. Secondly the weather in SA would have meant nice and easy nappy drying as well. So, if you’re flying and packing space is at a premium and weight is an issue, what nappies could you take? I probably wouldn’t bother taking night nappies – a few disposables would be a lot easier to pack than a bulky two-part nappy. I wouldn’t take many (if any) of my all-in-one nappies as they’re fairly bulky too. 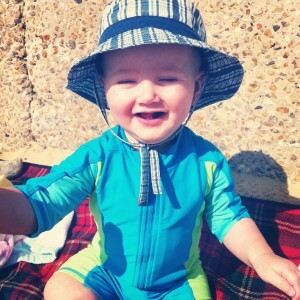 That leaves my gNappies, which, thinking about it now – now I’m not stressing about supporting Mum and finding appropriate clothes for Eli to wear to a funeral – would have been the perfect choice. I’ve never used gRefills (the disposable inserts for the nappies) but the hybrid nature of the nappies would have been really useful. Taking all my gCloth (cloth inserts) along with a few packs of gRefills would have been possible (I managed to take a few packs of disposable nappies after all) and I could have used a mix of both depending which was more appropriate at the time. Disposable inserts for the plane and long car journeys and cloth whenever possible. So, on reflection, whilst travelling abroad with cloth nappies seemed really difficult at the time, a hybrid system would have been perfect. Most of the benefits of full-time cloth but also the steady freeing up of space (for presents and suchlike) that using up disposables resulted in. Plus, using the cloth would have meant not as much money needing to be spent on the disposables – pleasing the skinflint in me – or too much heading to landfill – keeping the eco side of me happy. Throughout the year Tilly asks us “Is it summer now?” and for the quarter of the year where the answer is yes (regardless of the actual weather) her next question is always “Can we go to the beach?”. As we don’t really live too close to beaches that we (grown-ups) particularly like – I grew up in South Africa, beaches to me should be primarily white sand, not pebbles, mud or whatever else tries to pass for a beach on this island – to answer yes to the second question requires a good weather forecast and an early morning lest we spend too much time fighting for parking. So last night, with a great forecast for today and an agreement to forgo a lie-in this morning, we decided that today would be our beach day. Despite Eli’s attempts to prevent us having any sleep last night, R managed to make the sandwiches and I managed to get out of bed and together we were all out of the door by 8.30 for the journey to the sea. It was a lovely day. Eli touched sand and sea for the first time (not too impressed with either but began to enjoy the sand eventually). 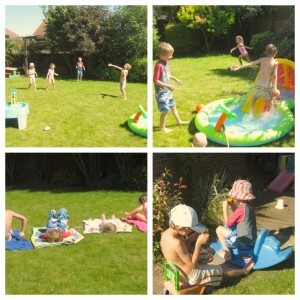 The big kids dug holes, built castles, splashed and ran in the sea. 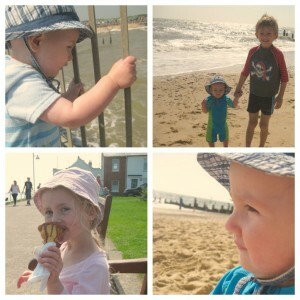 We visited the pier and the town and ate packed lunches and bought ice-creams. Now we’re home, kids are washed and in bed and R. has headed to the local 7-11 to buy cake. Absolutely brilliant day. Sunday was a fun day at Grandma’s – all the cousins (with Tilly missing) had a great time. Lex and his same age step-cousin T discovered they both are big Lego Ninjago fans – all the better to break the ice when you haven’t seen each other for a year. 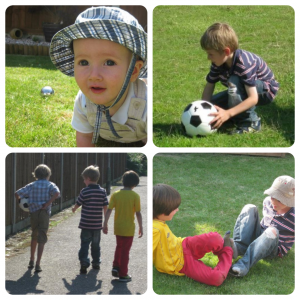 A game of boules kept the boys entertained in the garden, complete with a measuring tape to check distances and action replay on the camcorder (although they never figured out if T’s ball brushed or not). Finally a game of football in the park and a few runs around the obstacle course completed the day. Lex had a brilliant time but was so tired he was sobbing through most of the bedtime routine. Eli was ok when he was with me, sadly summer events (and lots of people who would like a cuddle with him) and ‘stranger’ and separation anxiety have arrived hand in hand at the same time. Today SIL and the local cousins came to visit for the afternoon. A trip to ELC after our family dentist appointment yielded a new paddling pool with a shaded area, sprayer and slide which (after I finally worked out how to get the air bed inflater to work) wasn’t too bad to inflate and fill. 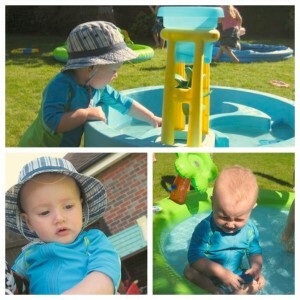 This, plus the water play table and SIL’s paddling pool enabled us to sit and watch whilst the kids had a great time. Well, the big kids at least. Eli clearly isn’t feeling 100% and was not impressed by the padding pool, being wet, the grass – pretty much everything. He cheered up at points but really just wanted to have an afternoon of cuddles poor dot. Currently he is in bed but waking up every half-hour or so needing another feed to settle him. The air-con is on so he won’t be too hot at least. The only hope now is that this won’t be the single decent week during the summer holidays – looks like it’ll change by the weekend sadly. Now, off to settle the baby once more. Today was the last day of the 2011/2012 school year. Lex, Eli and I enjoyed the school summer picnic out on the field and took a leisurely stroll home after lunch. Lex then went around to have a water fight with friends who live around the corner. I think he is relieved that school is finished for summer – the poor kid has a cough that he just can’t shift and is constantly shattered. We’ve bought him a children’s multivitimin to see if we can help him feel better. If the cough doesn’t clear up in a few days I think I’ll be taking him to the doctor just to check what’s up. 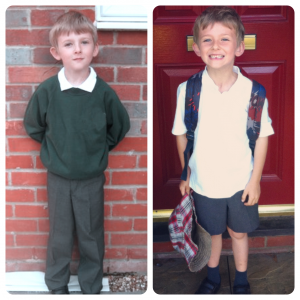 Here is Lex the year before – he’s grown up so much since the start of reception! Today was also Tilly’s last day of nursery. 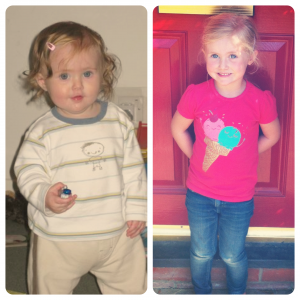 She started in the baby room just before she turned 11 months old (September 2008) and is finishing (after moving through each of their four rooms) at 4 years 9 months so she’s been there for almost 4 years! I’m really sad that she’s finished as we’ve been really happy with the nursery and will miss it. Eli is unlikely to ever attend there as it will probably be much easier to send him to the pre-school attached to the children’s centre next to the kids’ school. We gave them a thank you card and two boxes of chocolates – I’ll take Tilly back on her first day of school so that she can show everybody her school uniform. 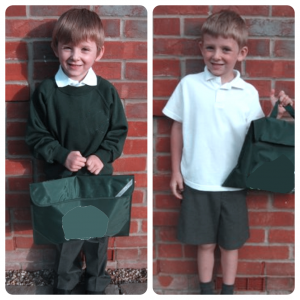 Finally we have Eli at the start and end of the school year – it’s hard to believe that this time last year I was very pregnant and still 5 weeks away from meeting my gorgeous little boy.